This is truly a band in a box, and one that you can use live to boot. Adds everything on our wish list from the original. If you're an absolute beginner, a seasoned pro, or anywhere in between, you still need to practise - and that practice time can be enhanced by playing along with a bass and drums rhythm section. Last year, DigiTech made that possible 24/7 with the Trio - a stompbox that generated combined bass and drum rhythms for any chord progression you played into it. The only snag was that, with limited onboard storage, the pedal wasn't designed for live use. Of course, players saw the potential, and DigiTech has responded to their feedback with the Trio+, which adds a synchronised looper facility and a whole lot more. You now get a choice of 12 music genres over the original's seven, including much-requested metal patterns, as well as electronic pop, hip-hop, rock and jazz, plus Micro SD storage for up to 12 songs and their loops - each song can now have five song parts, too - a real upgrade over the original's three. The Trio's genre-specific onboard guitar effects are still here, but there's also an effects loop to connect it up to your other pedals so you can mould your own tone. 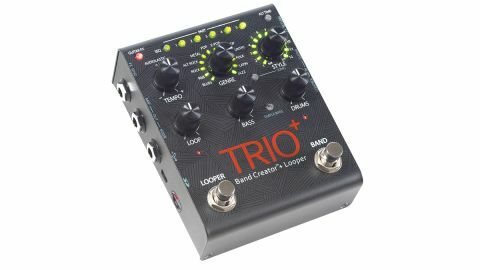 Using the Trio+ is simple, thanks to separate footswitches for band and looper. Generating a backing track is a matter of hitting the footswitch and playing a chord sequence clearly and in time, then hitting the footswitch at the end of it - stick to basic strumming, rather than arpeggiating or riffs, and the Trio will have no problems tracking your playing. If you haven't already, you can then select a genre to try out the various styles and see which best fits. You'll get a reasonably complex bass line initially - this was one of our main gripes with the original Trio - but there's now a choice of two simpler ones via the Simple Bass button, which is great news for acoustic players. From there, you can simply play guitar over the band, or use the looper to record initial playing and overdubs. These extra functions mean the Trio+ is no longer just a practice tool. If you don't already possess a looper pedal, you can use the rudimentary loop function here independently of the rhythm section. There's also the possibility of using the Trio+ as live backing, although you'll probably want to use the mixer output to run the backing into a full-range PA rather than through your mid-focused guitar amp. A sequence facility puts together automated playback of the five parts for each song, but if that's too rigid, there are possibilities for transitioning between parts on the fly using the existing footswitches, or adding DigiTech's FS3X triple footswitch. As a practice and songwriting aid, the Trio always was (and is) a brilliant resource but, with such an increased range of possibilities, the Trio+ knocks it out of the park.